The World of Captain Beefheart is a special concert featuring Gary Lucas with the 60 piece Metropole Orchestra performing symphonic Beefheart. 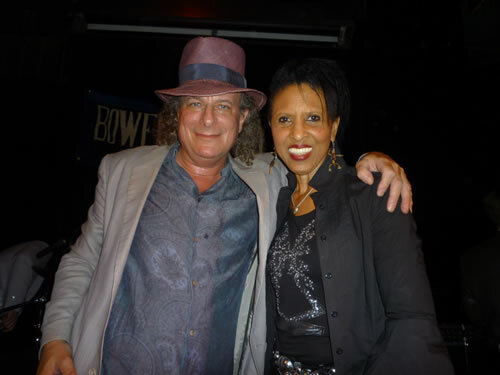 Special guest vocalist for the night is legendary Nona Hendryx (pictured below with Gary), who is also a big Beefheart fan. This event has been put together by Co de Kloet (the Dutch radio presenter who did the last lengthy interview with Don on the phone in the early 90’s). It will be broadcast live on Co’s radio show on national Dutch radio, NTR. It is also being filmed for possible broadcast. Tom Waits "had the nerve to think he could sing like me"
This promises to be a fabulous evening – authentic Beefheart arrangements (straight from the fly’s ear) and a 60-piece orchestra sounds like a lot of fun to me! Kudos to Gary Lucas for instigating this, I hope it’s a great success and a CD version follows… well, you have to be optimistic! I will be there (2 free tickets !) with my old friend Joost who is a genuine Beefheart-fan. He was at the concert in Paradiso (on November 1, 1980). Where was I then ? Anyway, we will discuss if Gary c.s. and the Metropool is fast and bulbous enough….